Revue de l'Enseignement des Esprits. Other titles: L'Union Spirite ou les Mysteres d'Outre-Tombe Devoiles 1865—1867? Weekly Bordeaux, France. Language: French. 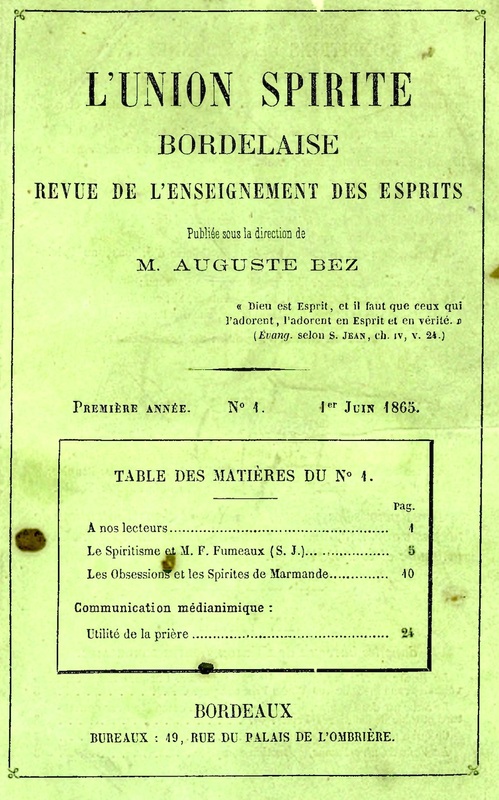 Editor: Auguste Bez, editeur scientifique. Succeeds: Voix d'Outre-Tombe; La Ruche; Saveur des Peuples 1/1, June 1865-May 1867(?). 22 pp. (reduced to 16 pp. in June 1866). This was a pure Kardecist journal, filled with discourses from the spirits on abstract topics and occasional reviews and articles on current topics. It was formed by the merger of La Voix d'Outre-Tombe, La Ruche Spirite Bordelaise, and Sauveur des Peuples. M. Bez was already the editor of La Voix d'Outre-Tombe. He was a medium in his own right but came to prominence when he edited the communications of writing medium Jean Hilaire, adding his own experiences in spiritism and stories about D.D. Home and others, and published them as Les miracles de nos Jours in 1864. The journal carried regular excerpts from the Banner of Light and replies to the "anti-spiritist" journals of the day and discussions of the relationship of spiritism and Catholicism, as well as notices and articles on the Davenport Brothers, D.D. Home, H. Melville Fay, et al. The Year-Book of Spiritualism for 1871 lists the journal as still extant at the time, though the copy in BNF ends in 1866. At some point the journal changed its name to La Union Spirite ou les Mysteres d'Outre-tombe Devoiles. BNF.